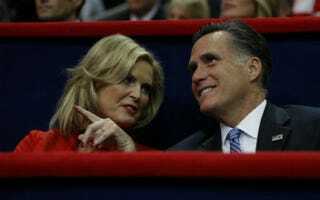 What Does Love Really Mean to the Romneys? At ThreeLOL, Danielle Moodie-Mills says that Mitt and Ann Romney are infatuated with a vision of America that's way out-of-date when it comes to young people and people of color. … Ann Romney, the human behind the robot, kicked off her prime time Republican Convention speech by saying, "I want to talk to you tonight about what binds us — love". She spoke about falling in love with her husband at a high school dance and their unwavering love of this country. Yet, as I was watching her speech I couldn't help but think of a quote from my favorite political film the American President delivered by Annette Benning's character Sydney Ellen Wade, "how can you have patience for people that say they love America, but clearly can't stand Americans?" But the policies that they are pushing decades after their romance began don't show any love or thought to the needs of others who are still suffering from the wrath of oppression and inequality. Read Danielle Moodie-Mills' entire piece at ThreeLOL.